Industry tools have been developed in the Impact Bond Market to assist stakeholders to qualify green, social or sustainability bonds. 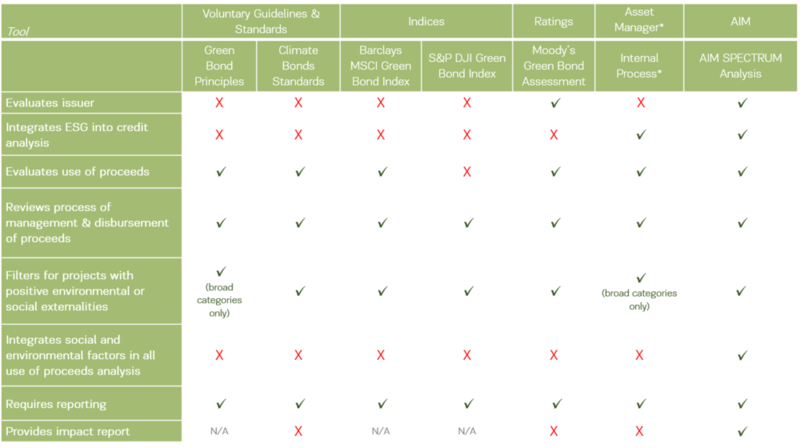 The most prominent tools are the Green Bond Principles, Climate Bonds Standard, Second Opinions, thematic indices, and Moody’s Green Bond Assessment. All cover different aspects of impact bonds. Affirmative developed SPECTRUM as a comprehensive tool to qualify impact bonds. The Green Bond Principles (GBP); launched in January 2014 by Bank of America Merrill Lynch, Credit Agricole, Citi Bank and J.P. Morgan; were created as a set of voluntary best practice guidelines to assist corporate green bond issuers. Now under the International Capital Markets Association, the GBP provide broad advice on Use of Proceeds, Process for Project Evaluation and Selection, Management of Proceeds, and Reporting. In 2016, GBP launched a Social Bond guidance based on the four principles. AIM is an active member of the GBP. The Climate Bonds Standard (CBS), development by Climate Bonds Initiative (CBI), provide sector specific criteria developed by technical working groups and approved by the Standards Advisory Board. Sectors for which criteria are currently available include solar, wind, low carbon buildings, low carbon transport, water and geothermal. Further criteria are currently being developed for bio-energy, land use and marine sectors. Second Party Opinions and Reviews are now common place in the supranational and European market. These are used as a means of completing an external due diligence on issuers' green bond frameworks and eligible projects and are often completed by scientific research centres, ESG research providers or environmental consultancies. Green Bond Indices are also useful discovery tools for certain investors. There are currently various indices using the GBP and in-house taxonomies as inclusion criteria. AIM manages against mainstream benchmarks for mainstream returns. Moody’s Green Bond Assessment (GBA) provides a transparency score based on the GBP for issuer frameworks. Launched in March 2016, the GBA is the first product offering for impact bonds by a large multinational credit rating agency. The score is largely based on the extent of available disclosure across the GBP and the use of external standards. AIM developed SPECTRUM analysis, a unique three- dimensional investment approach which embeds key sustainability criteria at the core of the overall process. SPECTRUM is an acronym of the fundamental criteria AIM requires for investment. To evaluate each issue against SPECTRUM criteria, we have a sustainability verification process with three key steps: verification, monitoring and reporting. AIM is a market leader in committing to annual impact reports for all our impact bond portfolios, including both quantitative and qualitative reporting.